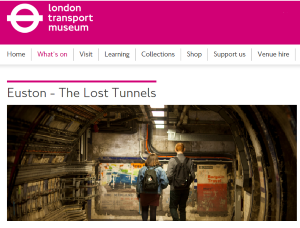 Hidden London, a series of tours at disused stations and secret sites around the city, is run by the London Transport Museum and lets you peek behind closed doors that are usually bolted shut. This year could be one of your last chances to see Euston’s secret tunnels as the area is slated for redevelopment. Each year more than 43 million journeys start or end at Euston, one of central London’s busiest Tube stations, but few travellers know that on the other side of the station walls are networks of abandoned tunnels and a disused ticket office – and most people zooming past don’t know that these once-forgotten areas of the station are opened up just a few times a year. Hidden London, a series of tours at disused stations and secret sites around the city, is run by the London Transport Museum and lets you peek behind closed doors that are usually bolted shut. Tours of Euston start in an abandoned station building that’s still decked out in its distinctive oxblood-red tiles, designed by one of London Underground’s most famed architects, Leslie Green. The tours of the secret tunnels may be coming to an end. Downstairs lie the labyrinth of dingy passageways, which are lined with fragments of vintage 1960s-era advertisements tempting passers-by to indulge in the latest hairstyles and theatre shows. One of the posters, remarkably well preserved, even announces the closure of the tunnels and advises passengers on the new route to take. The tunnels were closed with the arrival of the Victoria Line in 1968. There’s also a small tiled ticket office, harking back to the days when the branches of the Northern Line were operated by separate private companies, requiring passengers to have different tickets for each. Exploring the abandoned tunnels of Euston feel like waltzing through a time machine, but the end of the tour will pull you right back into the present as you look down through a grill at the modern platforms, where people wait for the next Tube to arrive, unaware of the history lurking above them. Euston is planned to be the terminus of the High Speed 2 rail line, which will connect London to the Midlands, and is scheduled to open in 2026. Construction around Euston station started in 2017, so the clock is ticking on how long the tunnels will continue to survive. Tickets for this Hidden London event and a handful of others go on sale on Friday and must be booked in advance. Be quick – they sell out fast.